Hawick honorary provost councillor Watson McAteer opens the cafe alongisde staff and volunteers. Scotland’s first support hub for former members of the armed forces and blue light services was officially opened in Hawick this week. The First Light Trust facility, made up of a charity shop selling ex-army clothing, bric-a-brac and books plus Sharpe’s Coffee Shop, moved into the former It’s Great outdoors shop at 1-3 High Street earlier this year. From left, David Murray, supporter Wendy Sproston and hub coordinator Carolyn Brown. And it was officially opened by Hawick’s honorary provost, Hawick and Hermitage councillor Watson McAteer, on Tuesday afternoon. Mr McAteer said: “While in simple terms, seeing an empty shop on the High Street being brought back to life is great news, a deeper dive into what this actually means for the town reveals something far more substantial and meaningful. “Interestingly, the trust is already looking after more than 1,700 veterans and their families across the UK. “Its purpose in life is to create a meeting point and develop a community of those who may need help, having suffered physical, emotional and psychological distress. Local musicians play at the opening of the First Light Trust hub in Hawick. 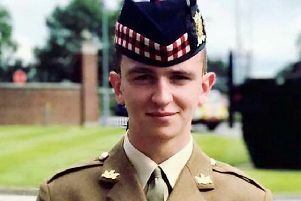 “It would be very easy to think that Hawick doesn’t really need this type of facility, but that would be a mistake and a denial that we have our share of veterans who struggle to cope. The national charity, set up nine years ago, already has four hubs in England, and volunteer David Murray, of Kelso, is tasked with bringing five more to Scotland. “Hawick was first, then it will be Perth, then Aberdeen then the west coast somewhere,” he said. “Hawick was a good choice for the hub due to it being home to a lot of veterans. David helps run the charity initiative alongside hub co-ordinator Carolyn Brown, of Denholm, plus one part-time and one-full time member of staff. Mr McAteer added: “I know you have already been surprised at how positive and supportive Hawick folk have been, and I know that will continue as your reputation grows.